Now we wish everyone out there in cyberspace a very late Happy New Year. We hope 2007 will be happy, healthy, and prosperous (in whatever order you decide is important) and will bring more interesting work on the Newport Tower Project. As Yogi Berra once said, ?The game isn?t over till it?s over.? Home at last! Our house and our herd of cats have survived - no, flourished - because of the kind help of our beautiful friend, Jennifer Michaud. Unpack, unpack unpack - this will probably continue into 2007. 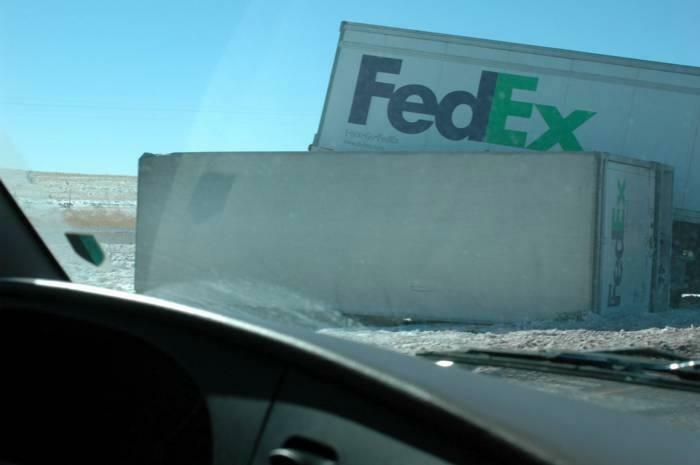 Disaster on New Mexico Interstate 40: trucks off the road, trucks turned over and broken apart in the median, trucks still being pulled off the highway or blocking exit ramps, trucks being unloaded and reloaded. It?s a cold and beautiful sunny day at the end of November, but the previous night?s snow left a wake of disabled vehicles behind it. We arrive in Winslow, Arizona, four hours late but thankful we weren?t among those who hit the road the wrong way last night. Are you old enough to remember ?Standing on the corner in Winslow Arizona? by the Eagles? That corner has been restored to what I suppose you could call its former glory. What you really ought to do in Winslow, though, is to visit La Posada Hotel on Old Route 66. La Posada, the creation of Architect Mary Colter for the Fred Harvey Company in the 1920?s, has been lovingly restored and reopened as the most wonderful hotel in the West, its front facing the railroad tracks, its gardens being recreated from Colter?s own plans, its Turquoise Room a dining experience, its rooms named for the hundreds of celebrities who stayed there during its heyday - and its prices reasonable. We try to make it the beginning and ending point for all our trips East and back West. Tonight it?s the perfect place to have a late supper and drink a toast to all the friends we left behind in Rhode Island. Wichita, Kansas, temperature 29°F. at 6:00 a.m. Something very weird is happening to the weather. Tucumcari, New Mexico, 4:00 p.m.: the skies turn black, and snow flurries begin; 7:00 p.m. : blizzard! Wichita, Kansas: temperature 68°F at 6:00 p.m. Trying to pack The Happy Adventure (our van and Project Field Office for our two months in Newport) requires a day and a half and a shoehorn. Once packed, we waddle across the street to say goodbye to Telly, Leeza, and Leon Amarant and their wonderful staff at the Aquidneck Restaurant. It?s late in the afternoon and hard to leave but leave we must. The Happy Adventure heads west - as far as Milford, Connecticut. Thanksgiving Day. We spend it with our friends, Suzette and Jay Schochet, and a couple from Oxford University, England. Turkey, and the world?s best stuffing made by Jay, are featured. Friendship is highest on the list of thanks we give.